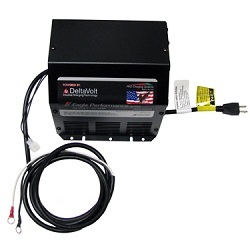 Pro Charging Systems OEM replacement battery charger i2420OBRMLIFT for various JLG, Genie, and Skyjack scissor lifts, boom lifts, and work platforms. 120VAC to 24VDC for fully automatic battery charging, 20 amp output. Specially designed to replace OEM JLG, Genie, and Skyjack lift battery chargers for industrial applications - safe, reliable, and efficient.